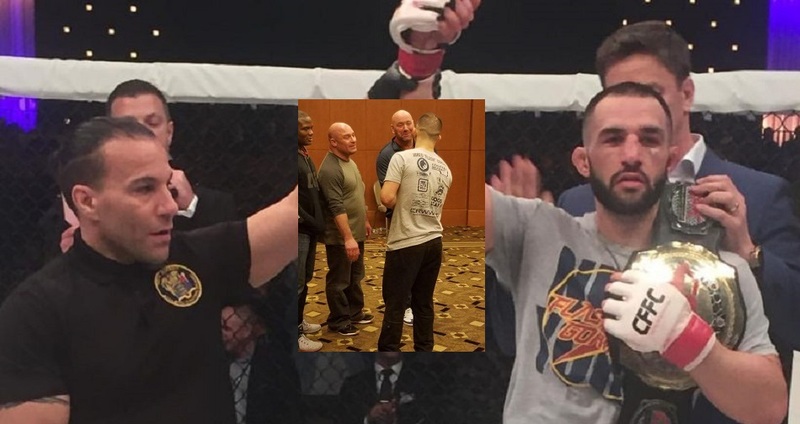 Jared “Flash” Gordon won an epic four round unanimous decision Saturday night at CFFC 63, in front of Ultimate Fighting Championship President, Dana White. Cage Fury Fighting Championships 63 took place at the Borgata Hotel Casino & Spa in Atlantic City, New Jersey, February 18. Gordon successfully defended his featherweight title in the co-main event. 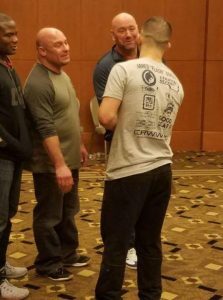 CFFC five-round bouts have a unique rule. The fifth round is only fought if after four rounds of competition the fighters are tied at two rounds a piece. Last night, Gordon held a 3-1 round advantage after the fourth round, giving “Flash” the unanimous decision. “Flash” Gordon improved his record to 12-1 with the win while White and his crew of retired famed fighters Matt Serra and Din Thomas were in attendance filming the YouTube series “Lookin’ for a fight” (a show where he attends local promotions in search of the next big star). Together they witnessed an impressive victory from Gordon inside the cage and expressed interest in signing the featherweight on the spot. White told the Church Street Boxing fighter he’s really interested and Gordon will be hearing from the UFC. “Feels great to know my hard work is paying off,” Gordon told MyMMANews.com. After his victory, Gordon spoke with Dana White briefly. “It’s been a long journey to reach my goals,” Gordon said. “Flash” didn’t put ink to paper yet, but he’s confident he’ll be fighting in the UFC his next bout. Gordon plans to compete at featherweight (145) and is also willing to fight at lightweight (155). The 12-1 warrior has fought several times at lightweight. The 28-year-old martial artist is ranked No. 2 among lightweights in the state of Pennsylvania (No. 2 among Featherweights), No. 4 in the Northeast and is ranked No. 1 among lightweights in New Jersey (No. 2 among featherweights), according to Tapology.com. Gordon’s 12 wins come by way of five (T)KO’s, two submissions and five unanimous decision victories, including last night’s win. Gordon won his CFFC featherweight title against Anthony Morrison, in the first round, at 1:48, on the CFFC 59 card (Video Below). “I plan to fight my heart out,” Jared “Flash” Gordon said. The current CFFC featherweight champion is wasting no time to get back to Church Street Boxing gym and training for his UFC debut. He also mentioned he plans to focus more energy on practicing his wrestling. The Queens native is open to fighting any opponent and is confident he’ll leave the octagon with a victory. No date for his UFC debut has been scheduled, though this New York fighter hopes to get his opportunity relatively soon.